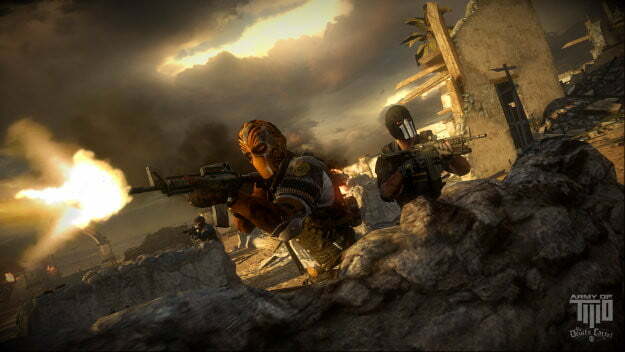 Army of Two: The Devil’s Cartel is a rare creature at the end of 2012. Smaller digital games, fewer franchises, calculated risks: That’s the business model that fuels Electronic Arts’ production these days. The company has multiple armies of creative people in its employ, spread across studios like BioWare, Criterion, Tiburon, and many others, but all the wild ideas dreamed up by those artists don’t turn into games under the EA banner. Two years ago, EA vowed it would cut boxed game releases by 40 percent as it turned to digital distribution and new game types. The transition is slow, but well underway; digital sales are surging while the big games of old like Command & Conquer are being re-imagined as free-to-play games. Then there’s Army of Two: The Devil’s Cartel a game which, based on a play session with EA in mid-October, is the sort of B-game that EA used to trade in at the beginning of last decade. It’s a co-operative third-person shooter with a soft-boiled mercenary-versus-drug lord story set in Mexico. There are destructible environments and aggressive enemies to flush you out of cover. There’s a helicopter boss fight. Imagine mixing a direct to DVD Bad Boys sequel with a bargain bin shooter, and you’ve got Devil’s Cartel. Then again, that description fits the previous Army of Two games. How does this milquetoast entry fit in the ecosystem of the new EA? What does it do that no other game does for the company? It isn’t quite fair to the game, speaking so harshly based on a single level. Then again, considering that the Ghost Town level in question comes late in the game—at least according to the EA rep walking me and fellow Digital Trends writer Adam Rosenberg through the demo—shouldn’t it be more representative of the unique scenarios and play you’ll get in The Devil’s Cartel? Here’s what happens: Partners Alpha and Bravo walk through a tan, brown, yellow, and grey compound shooting the soldiers of the enemy drug lord. Accompanying Alpha and Bravo in this stretch is an AI controlled Mexican woman related to the drug lord. (On an odd note, this character is virtually indistinguishable from the Latin hottie that accompanied Nathan Drake through Uncharted: The Golden Abyss.) The thugs come in a fairly familiar variety pack of regular soldier with an automatic weapon and cowboy hat wearing enemy with a shotgun. They are very aggressive in the cramped, tiered rooms you fight them in, gunning you down with impunity. My partner and I had to rush to each other’s aid more than a few times. Destroying cover is The Devil’s Cartel’s raison d’être. 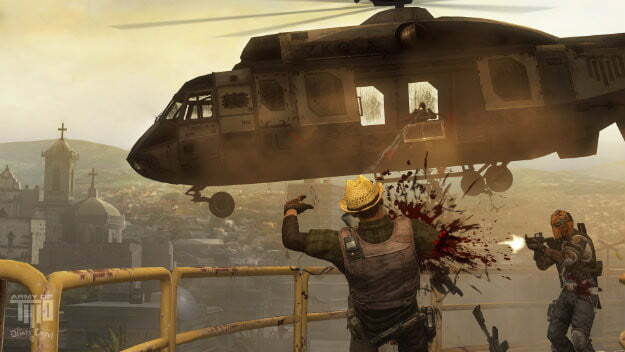 The game runs on DICE and EA’s Frostbite 2 engine of Battlefield 3 fame, meaning that the generic Mexican paramilitary compound is both highly detailed and highly prone to crumbling. If you’re hiding beneath the lip of an artfully tiled fountain in the middle of the room, your enemies will shoot those tiles away in big chunks until the bullets can get to you. This works in the opposite direction as well, and your ability to destroy a virtual mason’s hard work is tied to Army of Two’s Overkill system. Overkill is a meter, shared between you and your partner, filled as you take out baddies. Once full, you hit a button and go into a slow motion state where your bullets blast away chunks of walls, boxes, and concrete like a wrecking ball. If Overkill sounds like the “bullet time” modes of countless shooters released in the past ten years, that’s because it’s just like that with cover destruction. If the rest of The Devil’s Cartel sounds like every co-operative third-person shooter since Gears of War, that’s because it is. The late-game level culminates with a helicopter fight, for crying out loud. You shoot it until it crashes. End of story. The game also promises the opportunity to pimp out your guns and Jason Vorhees mask as in past franchise entries, but that type of character customization is ubiquitous in gaming these days regardless of genre. Just because something’s generic and familiar doesn’t mean it’s bad. Few will turn down a chocolate chip cookie made with the Toll House recipe, right? 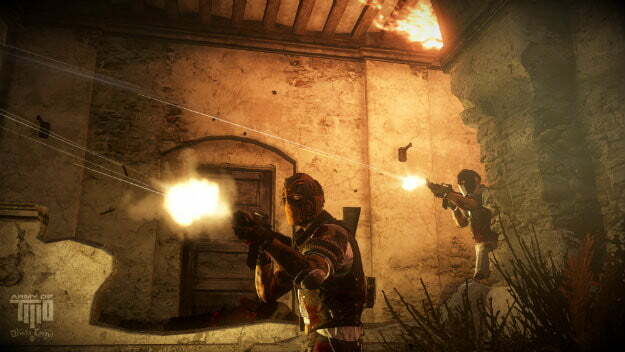 Army of Two: The Devil’s Cartel is perfectly serviceable. If you feel like shooting digital thugs in a brown and grey building with a friend and you haven’t already had your fill, by all means, check it out. It’s just disappointing that this is the game that EA, in this period when it’s consolidating and reorganizing, chose to make and that Visceral Games is the studio tasked with making it. Thing is, good-but-generic was Visceral’s stock in trade when it opened. It made James Bond: Agent Under Fire and The Lord of the Rings: Return of the King and The Godfather: The Game. In fact, the only time that studio transcended good-but-generic was 2008’s Dead Space. Based on this demo, Visceral is returning to its unexceptional roots and EA is continuing to fund less than interesting big budget boxed games.